Suitable for traffic flow at 5-10 mph. Few workplaces have as many potential risks to safety as a construction site. Whether indoors or out, a construction site can have literally hundreds of hidden hazards that can result in significant injury if left unaddressed. Ironically, many of the safety hazards found within the workplace can be the result of choosing the incorrect product for the job. For example, cable protectors are available in several different types. Although they are all designed to protect cables and cords from damage, this doesn't mean that all types of protectors suit every application. 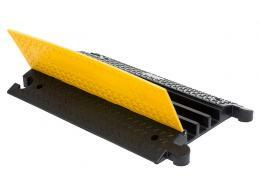 At The Workplace Depot we offer a wide variety of cable management systems and wire covers, including outdoor cable protectors, cable mats, and cable trunking. However, an informed decision can be made by asking a few simple questions. First, do the cords that need to be covered actually need to be run in or across that area of the site? Sometimes the best way to deal with the potential trip hazard of cords or cables at a site is to simply remove them. If it's felt that this is not possible, consider whether or not the setup can be redesigned so as to reposition or remove the necessity for cords and cables. 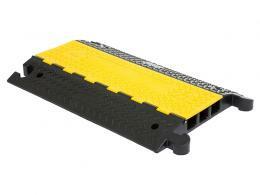 If cable protectors do need to be used, it's advised that they be used as minimally as possible. Other trip hazards can include strapping, ropes, and electrical leads, all with the potential for significant injury unless they are addressed. A daily routine that includes thorough and regular housekeeping can help to completely eliminate risks and the injuries they can create. As well, training employees to spot these potential hazards can mean even more eyes on the situation, which can result in a site that is that much safer to work in. Every power tool on your site should be fitted with the guards that were meant for that particular tool, as well as any other safety device designed for it. 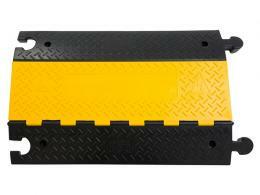 Not only must this guard be present, but it should also be fitted with a guard that is correct for the make and model. As well, the user of the tool must fully understand how to properly use and operate both the tool and the safety devices that come with it. Electricity, just as cables, cords and tools, can become a major hazard if it has been controlled correctly. Often, electricity is considered to be a 'silent killer'. For this reason, respect is the approach, which must always be taken when dealing with electricity. Only those trained in electrical equipment should be authorized to work on or with it. Otherwise, significant injury can be the result. Of course, no level of expertise can prevent injury of cords and tools have been improperly maintained. So once again, proper housekeeping can prevent injury from fault electrical cords. Water should definitely be a consideration when thinking about electrical safety. For sites with water-laden areas, any leads or power tools should be used and stored as far away from water as possible. Electrical circuits can become quickly overloaded without anyone noticing. Ensuring that not only the lead hands, but also the other workers on the site, take note of just how many tools are being used at the same time can help avoid injury. For more information visit the HSE website. 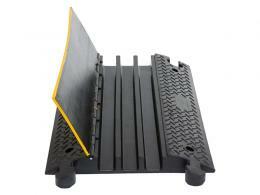 Where can an outdoor heavy-duty cable protector be used? 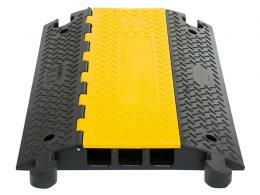 This product is ideal for both temporary and permanent installations. Suitable locations for temporary use include concert venues, construction sites, large outdoors events and many other situations where heavy cables run across vehicle paths. 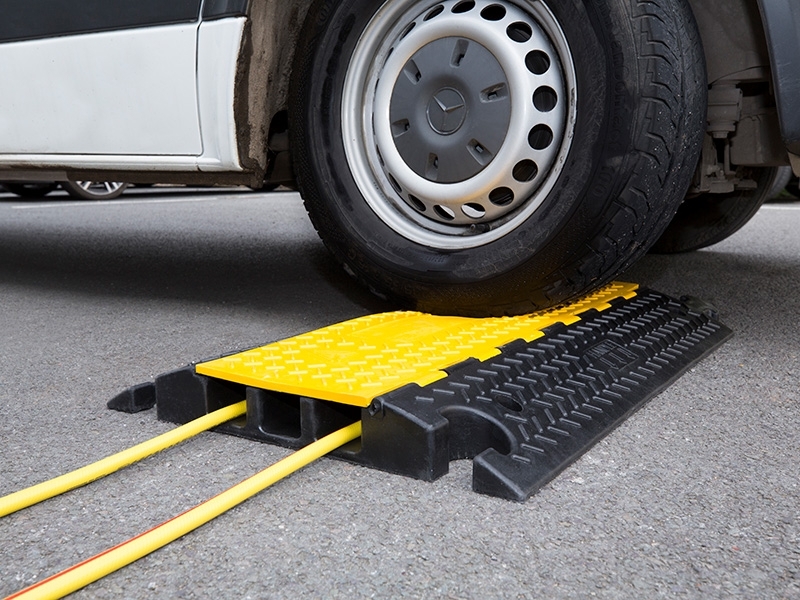 Parking lots are ideal as well, as are other commercial facilities where cables need to be kept safe from damage as a result of being run over by vehicles. 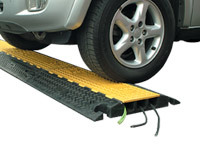 This product also has provisions for a more permanent installation, and the open, hinged ramp lid allows cables to be inserted even after the ramp is in position. This saves time and effort, as even a permanently installed protector can accommodate new cabling.